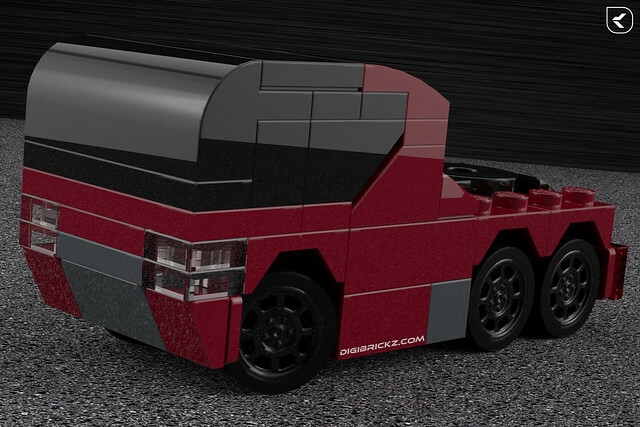 LEGO Tiny Turbo(s) – Concept Semi Truck! Well, actually i want to make a Futuristic Truck, but it’s done like a Concept Truck. Anyway, may you think this isn’t a concept too. But because this is just my idea and this model not available in Real Life, so you can call it Concept. It’s a Concept 6 (six) Wheeled Semi Truck. The ‘window’ is different from the first version (you can see on the Bottom), it inspired by Angka’s Ramen Truck. I don’t make the Trailer, though it’s a Semi Truck (Sorry!). The render is just weird as you may notice, because the Model reflect to the (Textured) Plane. Bigger Picture of the Model in my Flickr! Related Posts of "Tiny Turbo(s) – Concept Semi Truck"